Research Summary: Recent declines in imprisonment raise a critical question: Can prison populations be reduced without endangering the public? This question is examined by testing the effect of California’s dramatic efforts to comply with court-mandated targets to reduce prison overcrowding using a pretest-posttest design. The results showed that California’s Realignment Act had no effect on violent or property crime rates in 2012, 2013, or 2014. When crime types were disaggregated, a moderately large, statistically significant association between Realignment and auto theft rates was observed in 2012. By 2014, however, this effect had decayed and auto theft rates returned to pre-Realignment levels. Policy Implications: Significant reductions in the size of prison populations are possible without endangering public safety. Within just 15 months of its passage, Realignment reduced the size of the total prison population by 27,527 inmates, prison crowding declined from 181% to 150% of design capacity, approximately $453 million was saved, and there was no adverse effect on the overall safety of Californians. With a mixture of jail use, community corrections, law enforcement and other preventive efforts, California counties have provided a comparable level of public safety to that previously achieved by state prisons. Nevertheless, sustaining these policy objectives will require greater attention to local implementation, targeted crime prevention, and sentencing reform. A version of this paper was presented at the annual meeting of the American Society of Criminology, Nov. 2014. 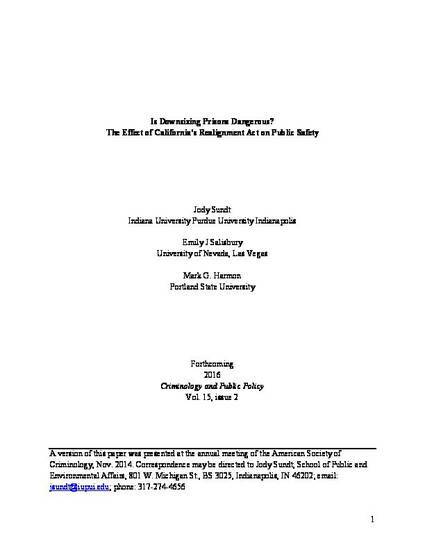 This is the post-print version of the article that will be published in Criminology and Public Policy Vol. 15, issue 2.